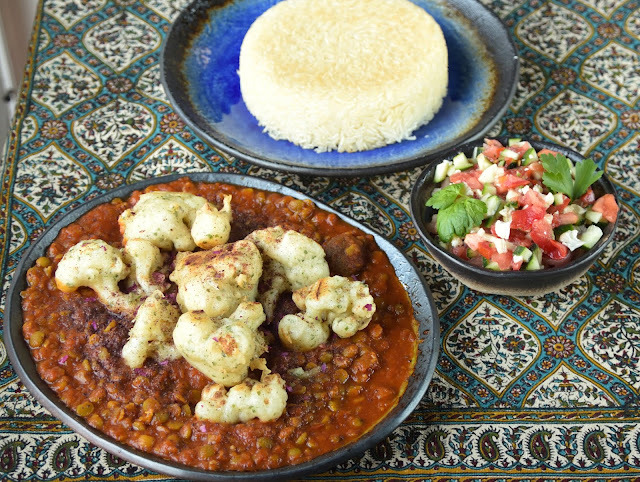 Consisting of split peas and finely chopped meat, "Khoresh-e-Gheimeh" is a classic Persian stew that is seasoned with dry lime and cinnamon and finally topped with fried potato sticks. Inspired by the beauty of Korean deep-fried cauliflower, I converted the dish to vegan by completely abandoning the meat and replacing the fried potatoes with deep-fried cauliflower nuggets. 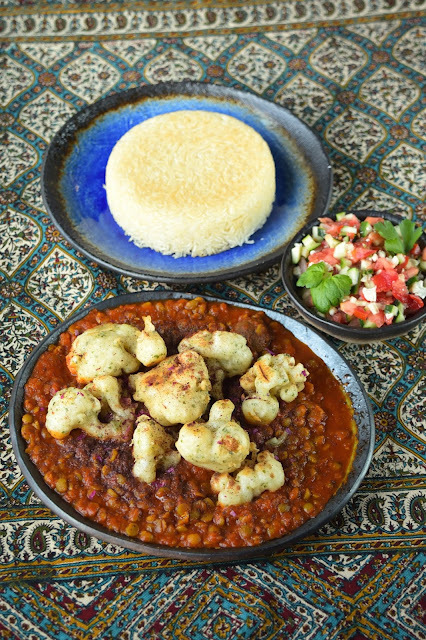 The final dish, while preserving the nostalgic flavors of an authentic Gheimeh, showcases beautiful textural and visual contrasts; surely a dish that even your carnivores friends will love and enjoy. To make the stewed split peas, caramelize the onion (or heat up the premade ones) in a pan. Toast the spices and rose petals in the oil for thirty seconds. In the meantime, wash the split peas and add them to a pot along with the crushed tomato and dried limes. 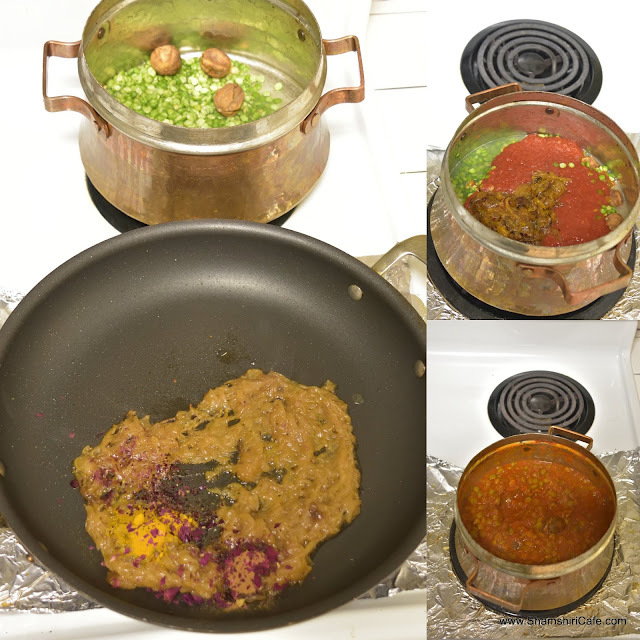 Add the onion mixture and enough water to the pot and stew on low heat until the pulses are fully cooked and the sauce is thick. When ready, mix in the saffron solution and set aside. When the stew is ready, make the cauliflower nuggets. 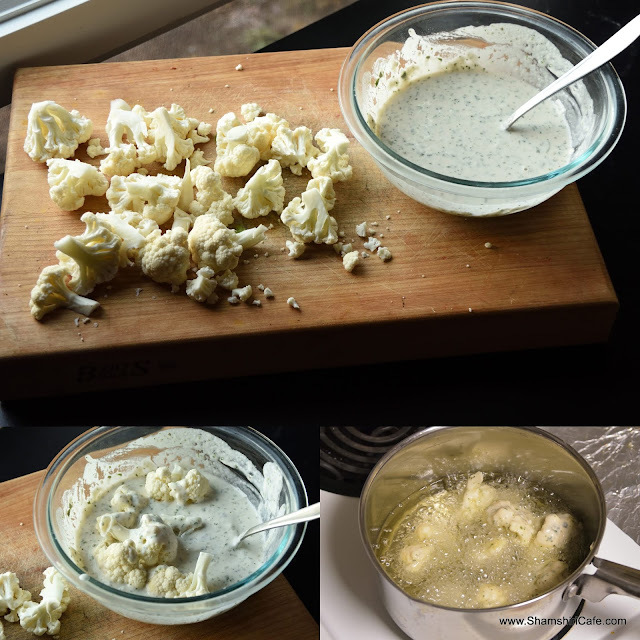 Mix all the batter ingredients and toss in the cauliflower florets. Deep fry in 350 F (~175C) oil for three minutes or until golden brown and very crunchy. If you don't want to bother with measuring oil's temperature, make sure the heat is medium high. Cover the stew with the nuggets and serve with Persian rice.